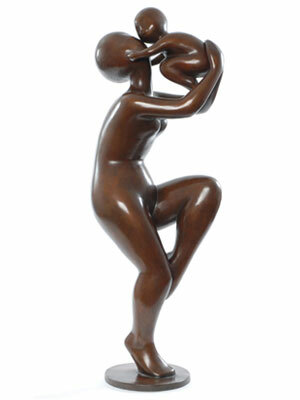 Museum quality sculpture for your home or headquarters. Artist Eric David Laxman sculpts substantial and elegant pieces. His chosen materials are metal and stone. He takes those raw composites and energetically transforms them into something at once very real and highly conceptual. When he’s pulling out of steel or marble its core character, his intensity is almost primal. It’s clear he’s wrestling with the essence of a shape until it acknowledges itself. He’ll use plasma cutters, oxyacetylene torches, arc welders, benders, hammers …chisels if he has to - to liberate the thing within. Still, for all the ferocity of the process, the finished sculpture is fine in the extreme. You don’t see the seams in anything Eric David Laxman has created. There is an elegant finish to his commanding pieces. Clean lines. A focus on the form. Smooth joints within the scorched steel. The feelings which get evoked upon viewing a Laxman sculpture orcustom hand railing? Beauty. Truth. An echoing of history, because for all the piece’s modernity, there’s classicism at play. And a real affirmation of life. Eric David Laxman has been influenced by early modern art and tribal art as well as Greek, Egyptian and Buddhist sculpture. That eclectic sensibility was what caught the attention of Nick Ashford when he was looking to visually brand the Ashford and Simpson Restaurant in Manhattan. Eric’s numerous decorative metal elements became environment-definers in the celebrated midtown setting. A diverse body of work also includes custom furniture and decorative metal. Laxman combines media exquisitely. EDL pieces are collectible, functional art. Focal points in a home, they are purposeful to use; pleasurable to own. Eric’s sculptures and functional art grace the homes and gardens of several Hudson Valley and Connecticut estates, as well as some company headquarters and select US art galleries. His clients find Eric’s collaborative process exciting. It marks a significant point in their own lives when artistry surrounded them and they got wrapped up in the creation of beauty. It’s ennobling to own original art. To also work with an interpretive artist, who can put your ideas and sensibilities into an evocative form which will last for generations – that is an opportunity not to be missed.